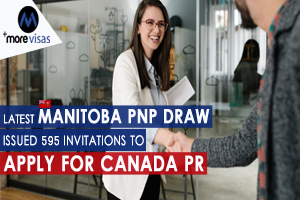 Manitoba conducted its 7th EOI draw of 2019 on Mar 28, inviting 595 immigration aspirants to appeal for a nomination of the province for Canadian PR. The invitations went to applicants in the Manitoba PNP’s streams of Skilled Worker in Manitoba, Skilled Worker Overseas, and International Education. The current invitations bring the sum issued by the M.P.N.P by these streams so far in 2019 to 3,199. Those called in the Mar 28 draw had an E.O.I profile enrolled with the Manitoba P.N.P. Presenting an E.O.I profile is the primary required step to be considered for a nomination from Manitoba province through the Skilled Worker in Manitoba and Skilled Worker Overseas streams and many pathways below the Stream of International Education. Profiles of EOI are given a score as per the factors that cover educational qualification, work experience, proficiency in the language and established relations to Manitoba and the high scored candidates have announced a Letter of Advice to Appeal (LAA) by regular rounds of invitation. An unknown number of applicants with a profile in the Canadian Express Entry System was present in the 260 Skilled Workers Overseas aspirants who obtained L.A.As in the Mar 28 draw. Federal Express Entry aspirants who got an L.A.A were demanded to have a valid job-seeker validation code and Express Entry I.D and minimum 06 months of latest work experience in a profession on In-Demand Professions List of Manitoba. Express Entry aspirants who appeal for and obtain a nomination from the province are granted an added 600 C.R.S points via their Express Entry CRS ranking score, ultimately guaranteeing an invitation to appeal for Canada PR in the next Express Entry Draw. The least-ranked applicant in this group of Skilled Workers Overseas aspirants had a 563 EOI score. Further 29 Skilled Workers Overseas stream applicants were declared L.A.As through an Initiative of Strategic Recruitment in the Mar 28 draw. These processes cover abroad hiring missions attended by the Manitoba P.N.P in association with businesses in Manitoba. The least-ranked applicant in this group had a 719 EOI score. The Manitoba P.N.P also declared 262 invitations to the applicants in the stream of Skilled Worker in Manitoba with scores as less as 433 in the Mar 28 draw. It was the weakest score so far in the year 2019 for a draw of Skilled Worker in Manitoba. The Skilled Workers in Manitoba is for qualified international student graduates and temporary foreign workers who are currently working in the province of Manitoba and have been given a permanent job with their Manitobian employer. Further 44 invitations were given to candidates in International Education Stream. This stream grants three pathways to Canada PR for qualified foreign graduates from post-secondary institutions in Manitoba.